The deadline for camera ready and copyright form upload is March 18th 2018. The PDF eXpress site can be accessed here, by using 41605XP as conference id. Please fill the IEEE eCopyright form available at http://www.lirmm.fr/~bosio/cameraready/ETS18/. The material must be submitted by March 18th 2018 via the electronic submission system at http://welcome.molesystems.com/tttc/ETS/2018/login.php. 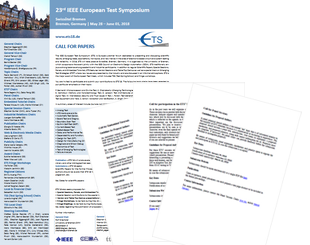 Please use IEEE proceedings two-column format (A4 size). You can find here the templates provided by IEEE. The camera-ready version of the paper must be submitted by March 18th 2018 via the electronic submission system at http://welcome.molesystems.com/tttc/ETS/2018/login.php.